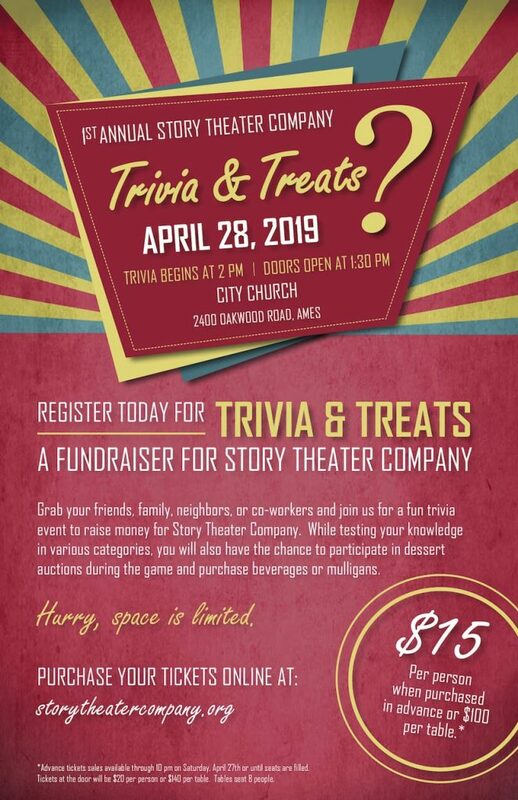 Join us for an afternoon of family friendly fun and competition as you put your trivia skills to the test! You! And your family, neighbors, friends, co-workers…everybody. Trivia questions on a variety of topics. Mulligans (free-answer passes) for sale. An opportunity to bid in our treats auction between rounds. Beverages (non-alcoholic) available for purchase. Prizes awarded to winning table. A chance to help raise money for Story Theater Company. Sunday, April 28 at 2:00 PM. Advance tickets available through 10 PM on Saturday, April 27 or until seats are full. Tickets at the door will be $20 per person or $140 per table of 8. *Payment by CASH or CHECK only can be accepted on site at the event. Please plan accordingly.